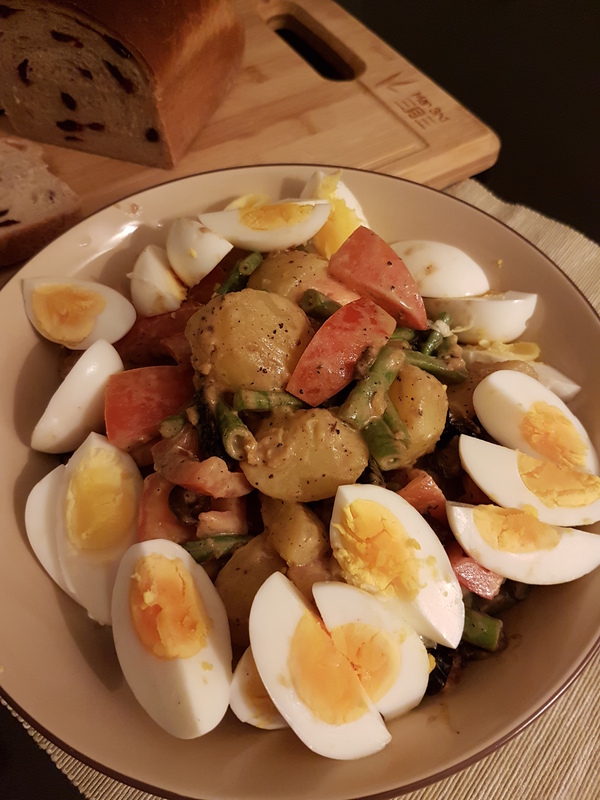 This is a SG-çoise salad. It’s a not-Salad Niçoise made from ingredients found in Singapore. Ingredients like ‘granola washed’ Brastagi potatoes from Indonesia, ‘crunchy crisp tomatoes’ from Malaysia. Bottled olives from Spain, Carrefour mustard from France and Kewpie mayo from Japan. The eggs are brown not white, are never refrigerated and sold only in multiples of five, not twelve. Why is it not Niçoise? A classic niçoise is made with olives, tomatoes, beans, eggs and anchovies – never potatoes. I don’t like anchovies. I do like potatoes. That not an ingredient is made or grown in Singapore. That it’s a mixture of savory, salty, bitter and sweet. That it’s food and it tastes good. Is it there a recipe? There can be. But it is here and not here. Because this not a recipe blog.